There are many advantages to riding motorcycles, which are exciting and fuel-efficient. However, there is nothing to buffer a crash with a larger vehicle or the pavement. Moreover, since motorcycles are so much smaller than cars, many drivers fail to see them when making lane changes or traveling through intersections. Motorcycle accidents can result in spinal cord injuries, paralysis, broken bones, brain trauma, and other catastrophic injuries, or even death. A life can be permanently altered by a motorcycle accident. 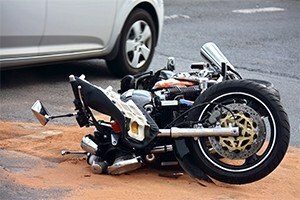 If you are hurt or a loved one is killed by a negligent driver, the Chicago motorcycle accident attorneys at Moll Law Group are available to help you pursue compensation. Billions of dollars have been recovered in cases in which our transportation accident lawyers have been involved. Drunk driving, unsafe road conditions, failures to yield the right of way, and distracted driving are all common causes of motorcycle accidents. If you are injured while on your motorcycle, you may be able to bring a lawsuit against the driver of a larger vehicle that struck you. In most cases, you need to establish the driver's negligence by a preponderance of the evidence. This means that you need to prove the driver's duty towards you, a breach of duty, actual and proximate (legal) causation, and damages. When a driver is texting while driving and therefore does not see a motorcyclist, for instance, this may be a breach of duty that causes an accident. Similarly, a driver who is eating lunch in the car, fails to come to a complete stop at a stop sign, and T-bones a motorcyclist likely has breached the duty to use reasonable care. A motorcycle accident lawyer in the Chicago area can help victims try to demonstrate a driver's negligence. In some cases, a motorcyclist may be partially at fault for his or her own injuries. Illinois follows a modified form of comparative negligence, which means that a plaintiff may recover damages if he or she is less than 51% at fault. This recovery is proportionate to the defendant’s degree of fault. The jury will determine the total damages and then assign a percentage of fault to each party. For example, the jury may determine the total damages are $100,000. If the plaintiff is found to be 30% at fault, and the other driver is 70% at fault, the plaintiff may recover $70,000 from the other driver. Damages that you may be able to recover include both economic and noneconomic costs and losses. Economic losses include medical expenses, lost income, household services, out-of-pocket expenses, and property damage. Noneconomic damages are more intangible losses, such as pain and suffering and loss of enjoyment. At Moll Law Group, our Chicago motorcycle accident lawyers are available to help victims seek the full range of compensatory damages to which they may be entitled. Our car crash attorneys represent people across Cook County, as well as in Schaumburg, Naperville, and Wheaton. Call us at 312-462-1700 or use our online form to set up a free consultation.